Elder Scrolls Online players will soon have the opportunity to trek to the ancient homeland of the Orcs by way of the upcoming DLC package entitled Orsinium, which goes live on November 2. The Orcish capital lies in ruins, but King Kurog has put out the word that intrepid adventures are welcome to come to his realm and help restore its lost glory. 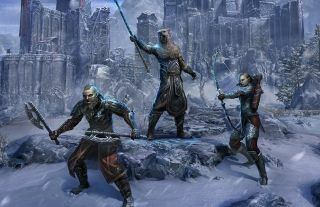 Bethesda says Orsinium will be the biggest Elder Scrolls Online DLC release yet (although it's also only the second, so take that for what it's worth), comprising a "vast new zone" with new enemies, allies, quests, dungeons, intrigue, and the Maelstrom Arena. And while it will no doubt take some time, the great city of Orsinium will be rebuilt. "Your efforts and actions while in Orsinium and the mountains of Wrothgar have a direct impact on the reconstruction effort," Bethesda said in the announcement. "The city will visibly transform." Orsinium will be free for players with an active Elder Scrolls Online Plus subscription, or can be purchased from the Crown Store for 3000 crowns for the standard edition, or 5000 crowns for the Collector's Bundle, which comes with the Cave Bear Mount, the Cave Bear Cub, and five Crown Experience Scrolls. Bethesda is also whipping up a free "base-game patch" for release at the same time, which will incorporate gamepad support for the PC, subtitles for all platforms, shield dyeing, improvements to battle leveling, and various fixes and tweaks. Launch details and other such information may be found on The Elder Scrolls Online website.